Louie Louie AY YA YA YA YEAH! Light it up! Driving electrics for the caravan (Brake Lights, Indicators, Fog lights, Reg plate lights, Front Sidelights) are now working and tested. (Apart from a front sidelight bulb, new one is in the post). Levelling the land! As the studio was parked on a slope we needed to get it level-ish to test the fridge and also for some interior work. This involved moving it and putting the wheels on ramps so we could get it level. It also it gave us some vital experience on how the studio is balanced and how it needs to be handled. It was when we were doing this we discovered that the state of the tyres was somewhat tired, more accurately they we really not in a good shape and we were concerned about them and as we have no idea how old they are or how they have been treated we decided that they needed to be replaced so things are safe and we know that things have been done correctly. So we had to take the studio off the ramps and onto level ground to jack it up and prop it on bricks on both sides to take the wheels off to get the tyres changed with ones that wouldn’t explode on the first trip out 🙂 Steve from Retro Restorations let us borrow a jack ( he is awesome and could have done the tyres but was booked up ) so we went to the equally awesome A44 Tyres who sorted both wheels out and even cleaned them up a bit too. While Mark was living the high life of hobnobbing with international tyre merchants, Adam and I set about finishing the cleaning of the exterior. 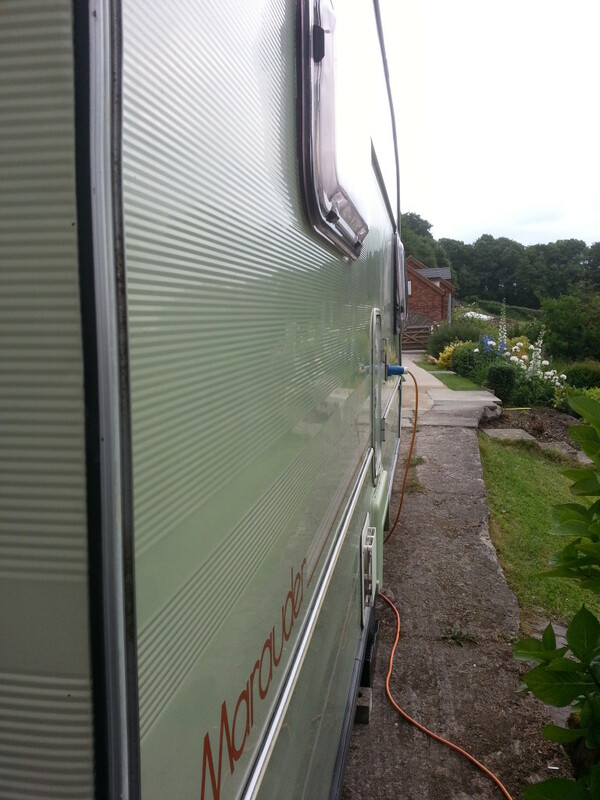 Helen and Sarah had done around three quarters of the caravan before it was moved about a month ago. Adam and I had a secret weapon up our sleeves… a 13mm semi automatic hosepipe! So we could rinse the grime off after we had cleaned 🙂 We also had to tackle the back end which was best described as organic 🙂 We then did the whole exterior (apart from the roof) and got behind the window seals too. 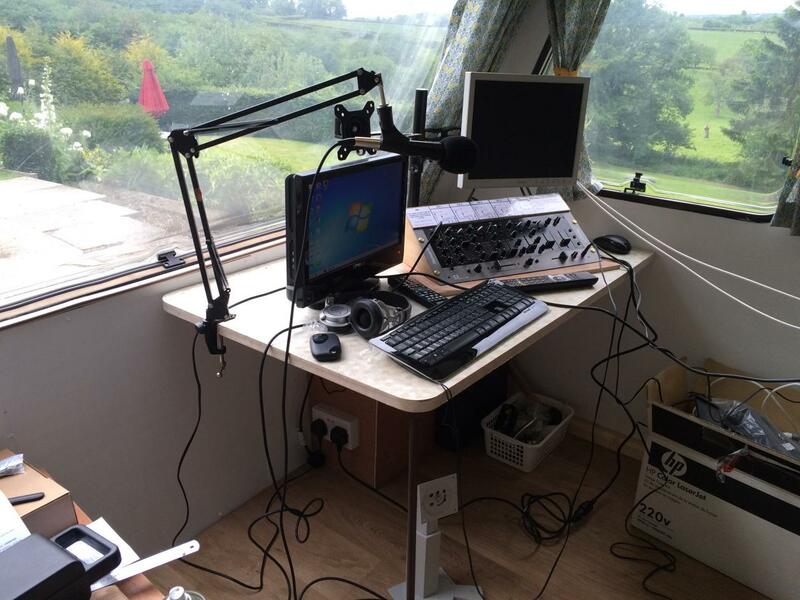 We also then took the time to relocate the studio in a better place so we could get it out easier. Lots of precision driving and doing it safely and right first time meant we got it back on the ramps in a much better place. After we had finished the dangerous stuff for the day there was just time for some fun 🙂 So at 5.15pm while Mark and I popped back to mine to grab some beer, Adam put the mast up and then it was a race against the clock (Gary Jackson was coming on at 6pm) to take all the bits we had and put them together so we could try a test broadcast over 3G from the mobile studio! I think it was the definitely the highlight of the day for me as although the tyre changes were definitely the most nerve racking, the caravan cleaning, when finished, was really satisfying, the way that Mark, Adam and I just slipped into working as a seamless team to get the station on air for a test broadcast was just awesome. Cables everywhere! When you have 20 mins to build a studio you don’t always have the right cables to do it neatly! Hear the historic first test broadcast! 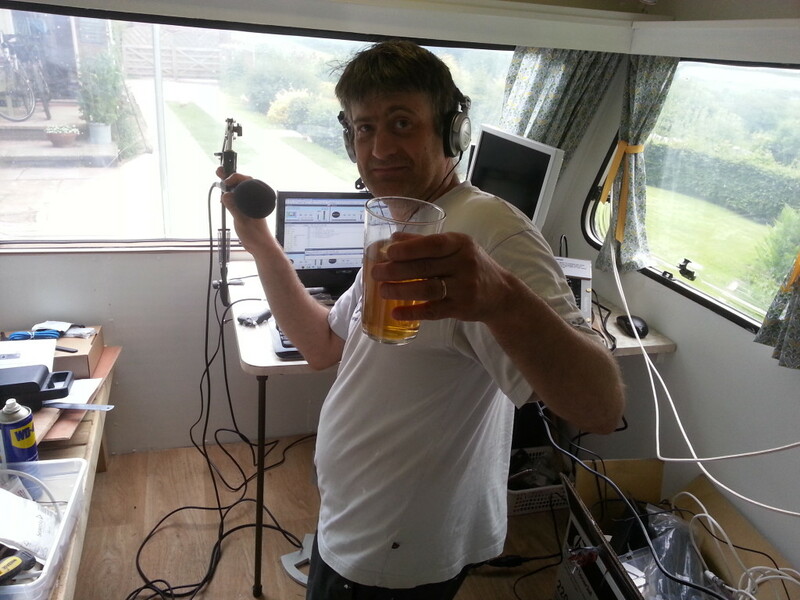 The moment Mark went live from the new caravan was a bit of a shock as I wasn’t aware things were working that well already – but nice to say a few words on this historic occasion! 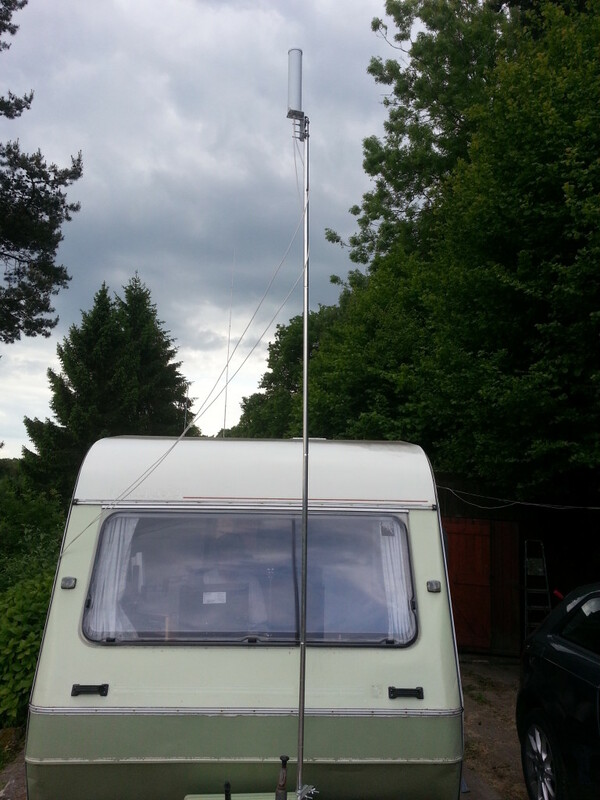 Oh and because we haven’t had a picture of it before, here is the mast and antenna! ← Suddenly a wild studio appears!